Got my new upright freezer today after a couple delays in delivery because of snow, ice, etc. My old one that died after 20+ years was a 13 cf and the new one is 17cf. It's taller so that means more storage space for yeast slurry, hops, bottles, etc. It's also got a slightly larger foot print. The old one held 4 kegs with the gas cylinder on the outside and line through the side. 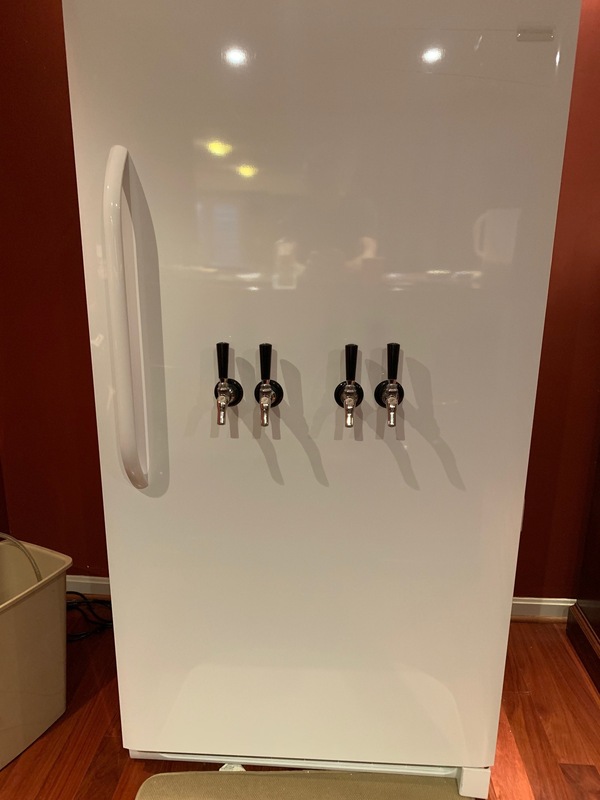 The new one can hold 4 plus the cylinder OR I could run the line out and fit 5 kegs. On the old one I had attached a stainless drywall mud pan to the door with construction cement. It worked but wasn't very pretty and didn't offer a surface to set you glass on while filling. Any suggestions for a nice drip tray to mount on the fridge door would be appreciated. Might even consider something with a drain/line for spill overs. I'd maybe wait to drill holes until after the warranty expires? I've seen some nice wall mount drip trays that can be mounted to the door via magnetic tape, or with some self tappers. 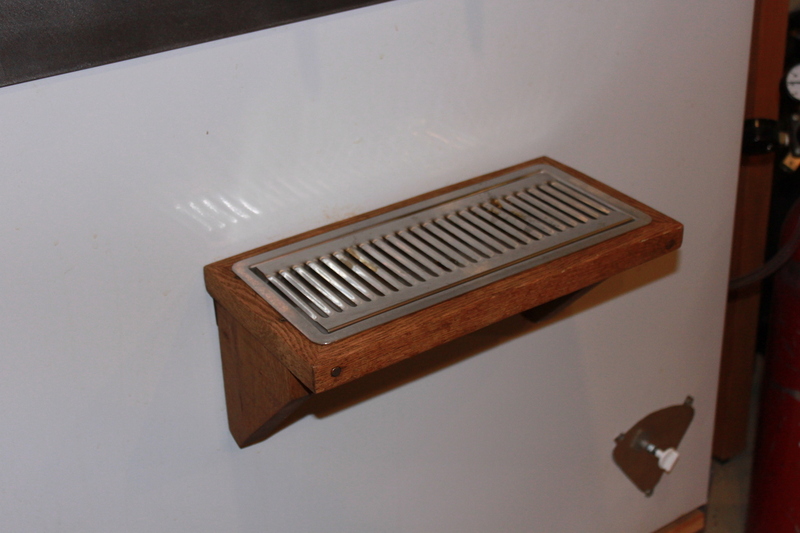 I built a tray frame out of wood to hold a purchased stainless steel drip tray. Some strong magnets hold the frame to my keezer. The tray just lifts off the frame for easy emptying and cleaning. The magnets are strong enough that the tray will hold at least a couple full glasses (I haven't tried more than two). You can find pictures, and links to the magnets in this post. I can provide more details if you'd like. Drilled the door for my taps and realized it's thicker than the old door...my shanks are about 1/4" too short! dagnabit!!!! Of course it's 3 times as much and I already drilled for my taps having no idea how those are placed. So yea I'm likely to order the first one from NB. Easy fix. Doesn't require me to sweat over trying to make something nice. Get a magnetic chalkboard for above the taps. Large one to get creative on. Which one? The NB one with a simple strip of oak or something over the mounting holes would dress it up nicely. Yea the NB "wall mount" one. Still considering options for the door but will depend on what direction I go with remodeling the tap room. Not sure how much effort I want to put into it since we're considering selling the house soon.